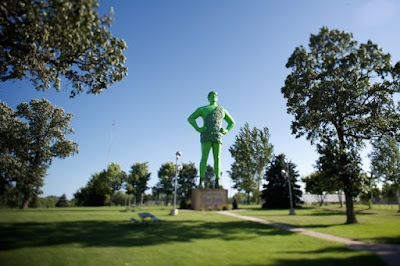 As I stood beneath the looming shadow of the Jolly Green Giant statue in Blue Earth, Minnesota, I observed the soothing flow of traffic on I-90 several yards away, and the cars slowly pulling in and out of the Dairy Queen parking lot across from the neatly trimmed lawns of Jolly Green's domicile. After months of anticipation, I knew in that moment that we had finally reached what Ryan so aptly describes in the current intro on our website as the "space in between." It is this liminality that makes road trips so salient to our personal experiences as individuals and as a couple. We have officially and successfully separated ourselves from the doldrums of our day-to-day, our to-do lists, appointments, and social obligations. I am not implying that our lives are hard to bear by any means. But we realize how hard it can be for us, as members of our society, to truly travel/move/flee from our daily routines. It is the space in between that one must find from time to time that speaks to and galvanizes our lives when we are living our "normal" everyday existences. And the further and longer we travel from the routine into the space in between, the more cogent the effects will be on our well-beings. In the following photos, we narrate the voices of Americana that we have been discovering along the way - those ironic, iconic, and campy artifacts of our lives as humans in this country. 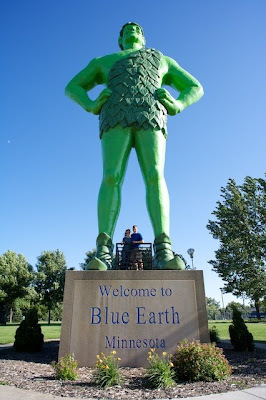 Jolly Green beholds his vast prairie empire in Blue Earth. 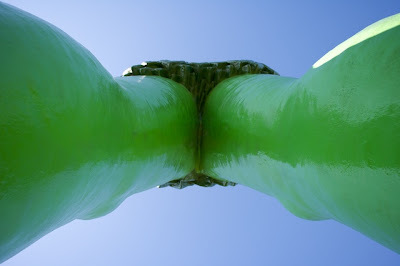 Always seek a different perspective. The roadways of America are a clash of kitschy tourism and vacant businesses. "Ben Biking" greets motorists just off I-90 in Sparta, Wisconsin, the bicycle capitol of the world. Snack time at the Love's truck stop in Wisconsin where we ran into travelers from Chambersburg, PA, a town just 30 minutes from our own...all we could say was, "Small world!" Tomorrow's adventure: The Badlands of South Dakota, Wall Drug, SD, Devil's Tower in Eastern Wyoming, and camping in Bighorn National Forest in central WY! Our trip has begun! We pulled out of our driveway at approximately 8:15 a.m. on Sunday, June 28 and drove away from our cozy abode. It felt strange to be leaving a place we always used to travel long distances to visit. 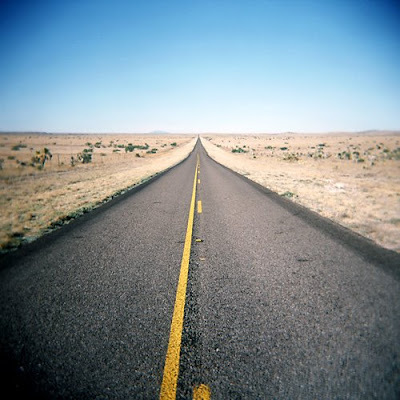 Now, it is our home and (most likely) permanent dwelling place, so this time we take to the open road not to go home, but to test our mettle at traversing the open highways of our country again. We take to the open road to make sure we aren't getting too comfortable at home. The trip yesterday was very smooth, and we were even able to make a last minute stop in Cleveland to see our friend, Kathryn, who we had not seen in 3 years. 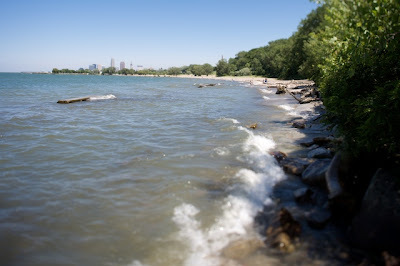 We had a nice salad lunch, ate gourmet chocolate that Kathryn gave us as a gift, and walked down to Lake Erie for a few minutes while our dog played in the whitecaps lapping the shore. 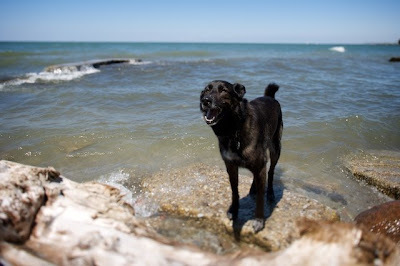 Sadie in Lake Erie - she loves road trips! Outside of Cleveland, and headed out into the plains of the mid-West, we hit some wind gusts that sent our gas mileage plummeting. Our Honda Fit normally gets excellent mileage for a non-hybrid, but since we have a roof box the winds seemed to grab it and push us in the other direction. We arrived safely in Chicago at my best friend, Emily's, apartment around 8 p.m. last night after a long day of driving. We had a lovely dinner with her and her boyfriend, Jon, at Hopleaf Bar (mussels, wine, craft-brewed beer, yum) - and then went straight to bed! The open road is like a long-lost friend you forgot you had. Once you are finally with it, you realize how much you missed it. Ryan and my relationship began on the road, so when we return to it, it stirs up memories and emotions from almost a decade ago. With your dog and spouse as your only companions, and your car, packed to the hilt, containing only possessions you truly need, one can't help but feel a deep sense of satisfaction and exhilaration at what lies ahead. Creative Highways Project 2009 Itinerary! 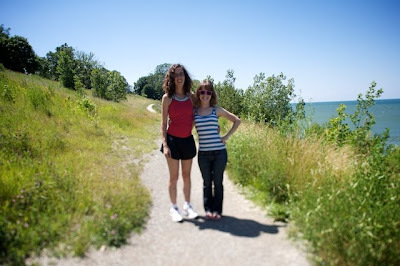 June 28 – depart Mercersburg, PA for Chicago, IL to stay with Larissa’s best friend, Emily Adair Peterson. Urban fun, Vespa rides, perhaps a stop at The Hideout - and dinner out. June 29 – Chicago, IL to Kadoka, SD, the gateway to the Badlands National Park and Wall Drug, both common stops on our past trips West. 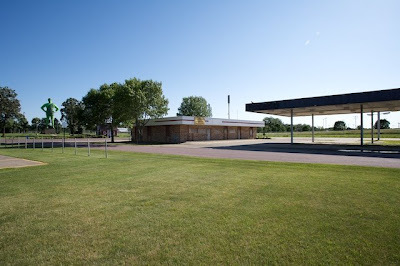 June 30 – Kadoka, SD through the Badlands, and on to Bighorn National Forest, WY. Though not yet in the “Rockies”, this recreational area rises straight out of the central Wyoming plains and offers beautiful and dramatic vistas and higher elevation relief from the heat below. We’ve camped there before and love everything from the drive up to the explorations above. July 1 – Bighorn through Yellowstone National Park (Yellowstone in the summer is a bit much to take. We can only take the bumper to bumper traffic through a wildlife area for so long - try it in the winter, it's glorious! ), and on to Grand Teton National Park for more camping. The Tetons take our breath away. 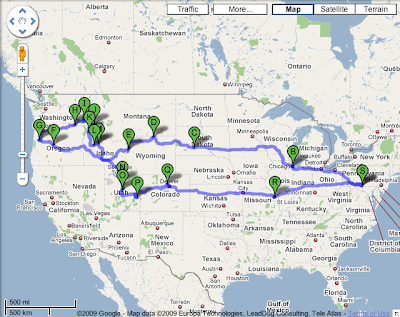 July 2 – Breakfast in trendy Jackson, WY, then a drive to Bend, OR (via Pocatello, Twin Falls, and Boise, ID). Don't know if we'll have time to stop off for some climbing at Smith Rock, but it would be sweet. We were there in the fall before, though, so it might be a bit toasty to climb there in July. July 3 – Bend, OR to Corvallis, OR to stay with friends, Kendra and Adam. Their dog, Jake, just had knee surgery, so even though he and our dog, Sadie, love to play, we'll have to make sure they only have so much fun! Kendra and Adam moved out to Oregon last fall so that Kendra could attend Oregon State University's graduate geology program. We're excited to see where they've been shacking up for the past year. July 4-5 – Celebrating our furthest point West and our nation’s naissance on the Oregon Coast with Kendra and Adam. Mmmm, the misty Pacific sea cliffs, a camp fire on the beach, wine, the dogs, good friends - nothing like it! July 6-7 – Bumming around Corvallis and Vicinity - hangin' with the dogs and Kendra and Adam. July 8 – Corvallis to Walla Walla, WA for some wineries and Palouse Falls. July 9 – Walla Walla, WA to Moscow, ID, our old Idaho hometown, where we lived from 2001-2003! We will spend two nights staying in downtown Moscow and visiting old haunts such as John’s Alley, the Moscow Food Coop, friends, University of Idaho (Ryan's alma mater and Larissa's former employer), etc. July 11-13 – Moscow to Lochsa and Selway River regions for hotspringing, camping, and general no-man’s-land-ing. July 13-15 – Lochsa/Selway area to Riggins, ID for camping on the white sand beaches of the Salmon River, our favorite river in the world! You get a whole beach to yourself! Hope to find French Creek hot springs way up along the canyon walls where we went for Ryan’s birthday in 2003. July 15 – Riggins, ID to the South Fork of the Payette River near Lowman, ID. More hot springs and beautiful vistas of the Sawtooth Mountain Range await! Just the drive alone is gorgeous. July 16 – To Redfish Lake, the furthest point East that salmon swimming from the Pacific Ocean along the Colombia River travel - a gorgeous lake near Stanley, ID, nestled along the Sawtooth Mountain Range. July 17 – Redfish Lake, through the Sawtooths, south through the Snake River plain of Idaho, and on to Provo, UT for a motel, clean-up, and gearing up for more camping. July 18-20 – Provo to Joe’s Valley in the Manti-La Sal Mountains, and the San Rafael River - a climbing and bouldering mecca and a place we remember loving to camp – gorgeous. July 20-22 – Joe’s Valley to Moab, UT area for some explorations of Arches National Park and the Canyon Lands. July 22 – Moab to Boulder, CO in search of the Green Hornet sushi roll, which we ate there way back in 2000 (our first year together). We think we might be able to find it here. Will it taste as good now as it did then? July 23 – Boulder to St. Louis, MO – we’re truckin’ now, haulin' home. July 24 – St. Louis to Mercersburg, PA - home at last! Click here for an interactive map of our trip. 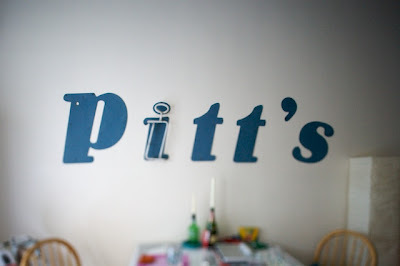 Upcoming Photography Project: Creative Highways 2009! We have a wonderful trip on the horizon! 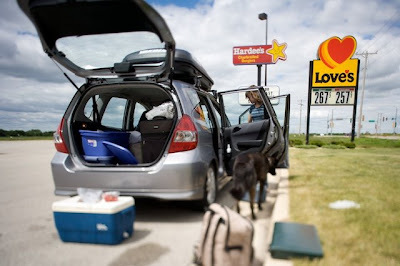 Starting on June 28, we will be packing up our Honda Fit and driving from Mercersburg, Pennsylvania to the Oregon Coast in 5 days, followed by several weeks of touring through Washington, Idaho, Utah, and Colorado, and many points in between. From 2001-2003, Ryan and I lived in Moscow, Idaho, so this is our chance to return to one of our hometowns with our dog in tow (she was born and adopted out there), as well as explore some of our favorite haunts and new vistas along the way. Though a personal trip in its majority (this was going to be our honeymoon 3 years ago, but we went to Maine instead), we will be using this opportunity for business purposes as well. Ryan is very excited to get back out to the Wild West and take photographs of all the wonderful things we'll see along the way. The simple nature of driving across the country will allow us to step away from our daily logistics and focus on a few small tasks each day: drive, stop, take pictures, explore, drive, stop, camp, get up, drive, stop, etc. 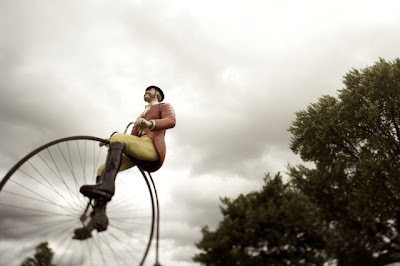 Our creativity will be re-energized as the artifacts of Americana and open highways of this land unfold before us. Some we have seen before during our many trips across the country while we lived in Idaho and Texas, and many we will look at with new eyes. Others will be new to us, but all will be stimulus for our creativity. Whether as inspiration for a new collection of photographs, or some new songs for Larissa's band, we are so excited to be able to spend four weeks outside our office, home, and town, and get out and explore our beautiful country. We plan to document our trip on this blog, as well as Larissa's personal weblog, Good Life Project. We hope you will check back periodically to watch our progress and see some of the beautiful photographs Ryan will be taking. We're making our travel itinerary now, so we'll keep you posted as things develop. 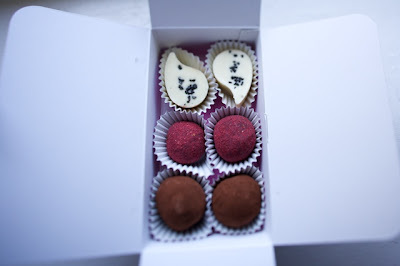 Happy shooting, and may your summer travels be gleeful and creative!